Chris Betts, 21, and his roommates walked around Towson’s CVS Pharmacy late on a Sunday night, not seeking out a pack of cigarettes, but a pack of children’s sidewalk chalk. They headed to Towson University’s Freedom Square, hoping to create a work of art capable of viral Internet distribution. After hearing about “Twitch Plays Pokemon Red,” an Internet-based live stream that allowed a massive number of players to simultaneously control one character, Betts was enthralled by the potential inherent in the platform. Fan art dedicated to the game was blowing up their Tumblr feeds, so the roommates decided to try and turn their inspiration into a mural. The three friends erased a discussion on Stand Your Ground laws and drew the chalk mural in it place (seen above). Betts determined the overall layout, while roommates Dominic Geppi and Alister Miller drew the actual game characters. By the next evening, their mural had made an appearance on both Tumblr and Reddit, the number of “reshares” and “upvotes” slowly mounting into the thousands. The roommates took their ownership in the buried comments of Tumblr notes. 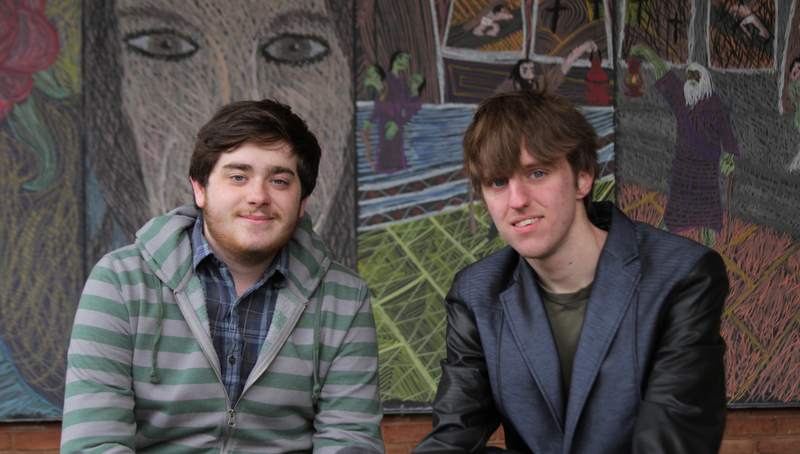 Dominic Geppi (left) and Chris Betts sit in front of the chalkboards at Towson University’s Freedom Square. The roommates drew a mural dedicated to “Twitch Plays Pokemon Red,” garnering over 4,000 likes and reblogs on Tumblr (Photo by Mark Burchick). “Twitch Plays Pokemon,” or TPP, is a channel intended as a social experiment on the live video game streaming website Twitch.tv. By enabling any viewer to have full access to the control of the main character, what was once a single player game effectively became playable by upwards of thousands of players at once. “The experience of watching ‘Twitch Plays Pokemon’ is amazing because it’s so fast that you can’t comprehend what’s happening and yet it’s so slow because of that problematic input,” said Ryan Murray, a professor of digital culture studies at Towson University. “The most amazing thing about it is that it doesn’t work. This platform works because it doesn’t work and that is the joy that people have found in it,” Murray said. TPP was officially launched in February 2014 and consists of two windows: a chat box and a live display of the action. When a viewer types a command into the chat box, such as “up,” “start” or “a,” the in-game character shown in the live feed will do that action after a certain lag period. With so many players typing different commands simultaneously, the game is harder to play and takes a longer time to complete. The character is often stuck performing erratic movements, such as walking in circles and repeatedly bumping into walls. This crowdsourcing proves even more daunting when tasked with completing tedious mazes or navigating cliffs. One instance in which the in-game character had to take 12 steps to the right, past a precarious ledge, took users hours to complete. One of the game’s mazes in the Team Rocket Headquarters had players stuck for two days. As a result, the designer of the platform introduced two different modes in determining the directional input of the game, which users came to describe as “anarchy” and “democracy” modes. Anarchy mode is the original inputting mode that allows all players to type a command, have it queued into a list and then applied in-sequence after a 30-second lag period. Democracy mode opens up a 30-second voting period in which the most popular input is selected and applied. The game was designed and continues to be refined by an Australian-based programmer who asked to remain anonymous in a Skype interview. Although he wouldn’t give an age, he said that he was male and that he is old enough to remember having played “Pokemon Red” as a child. “With the vast majority of streams on Twitch the focus is on someone playing a game. I thought it would be better if this stream didn’t have a ‘someone,’ ” the programmer said. Murray said that the Internet began with an “ethos of anonymity” that still exists today, combating the larger trend of social media networks such as Facebook. By having the creator align an identity with the project, it could lose a sense of “purity or community,” and result in a chilling effect on the participation of its audience. The programmer said that Twitch.tv’s intended purpose is for streamers to play a live game for their viewers. For TPP, he wanted the focus to be on the game, its contents and the community. “Pokemon Red” and “Pokemon Blue” were introduced in America in 1996 by the Japanese-based video game company Nintendo. The turn-based role playing game focuses on capturing, battling and trading Pokemon, various “pocket monsters” that roam the environment of the game. Players win the game after facing a series of consecutively more difficult Gym Leaders, culminating in a battle against the Elite Four to become the Pokemon Champion. Pokemon continues to be a hit among children and the original fans that have grown up with the series. Books, playing cards and an animated TV show are only a few of the media involved in making the Pokemon video games the second most popular video game franchises ever, behind Nintendo’s Mario series. Twitch launched in June 2011, hosting a variety of games, tournaments and game-related shows. With more than 45 million unique visitors per month, Twitch was recently named by the Wall Street Journal as being the fourth largest source of streaming traffic in the U.S., ahead of both Hulu and Facebook. During the first run through of TPP, the channel saw over 120,000 active, simultaneous users and 36 million unique views. The channel itself now currently has over 61 million views. With so many active users, the chaotic nature of the system and the inability to effectively strategize in the chat box demanded change, Murray said. Users truly dedicated to finishing the game found incentive to talk elsewhere, pushing strategy discussions to Reddit and other websites. It was on these websites that the collective conscious of TPP began to craft the “narrative” of the game. Mark Roebbelen, 24, captured the TPP community’s attention after releasing “Praise the Helix,” a song dedicated to the user created mythology. Roebbelen began watching TPP in mid-February, when the chaos was restrained to around 7,000 people. He found himself glued to the Reddit and Tumblr coverage every time he sat to eat a meal in his Toronto home. At one point in the game, the player has to choose between a Dome or a Helix Fossil that blocks his path. One of these items can later be used to revive an “ancient” Pokemon, but until then, it simply remains in the player’s inventory as a selectable item. “By complete random and chaotic chance” users grabbed the Helix Fossil, Roebbelen said. Throughout the play through, users constantly selected the Helix Fossil in their inventory and were told “It’s not the time to use that,” by the in-game menu screen. “It happened so often and I think people were just getting frustrated by all the chaos and slow progress that it kept things more exciting to make light of the situation,” Roebbelen said. Users quickly took this arbitrary selection as a “consultation” of a holy relic. Other characters had already been put on a religious pedestal, such as “Bird Jesus,” a nickname for the community’s main bird Pokemon. 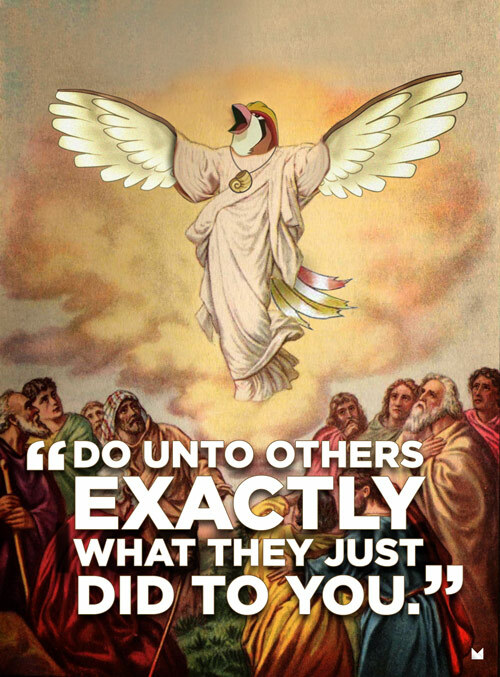 A meme depicting “Bird Jesus,” the main Pokemon used during the playthrough. The meme refers to Bird Jesus’s main attack, “Mirror Move,” which replicates the most recent attack of the character’s opponents (Image from Reddit). “I was about three or four days into watching the stream and the “Praise the Helix!” phrases and memes were starting to get thrown around,” Roebbelen said. “I was just singing some lines aloud about the Helix Fossil and ‘Bird Jesus’ in this epic choral style to entertain my girlfriend. I jokingly said, ‘What if I were to actually put a song out there?’ My girlfriend encouraged me to do it, saying I had nothing to lose,” Roebbelen said. Roebbelen saw that all of the memes focused on “glorifying and mythologizing” the arbitrary decisions the “hive mind” would make. “I thought to myself, why not take that concept, and put it to music that really takes itself seriously?” he said. Roebbelen commits anywhere between 60 to 100 hours a week writing and performing music. One particular moment in which a series of horn blasts ring out in memoriam of fallen Pokemon was intended to evoke a “Monty Python and the Holy Grail”-esque vibe, Roebbelen said. Roebbelen released “Praise the Helix” under the name The Church of the Helix Choir on February 26, 2014, where it reached 160,000 views in 12 hours. The song not only popped up on the usual slew of TPP community-driven pages, but also saw some attention from The Guardian. It came as a surprise to Murray that “Twitch Plays Pokemon” developed its own religious mythos. Internet communities, such as those found on Reddit and other image board websites, such as 4chan, are quick to make memes, icons and mascots out of any process. But between the Church of the Helix Choir and the emergence of a mock-Bible detailing the events of the story, TPP heavy religious overtones have sparked discussion among its observers. “Like a religion, ‘Twitch Plays Pokemon’ gave people the room and time to build a community and culture from the ground up that they were a part of,” Roebbelen said. 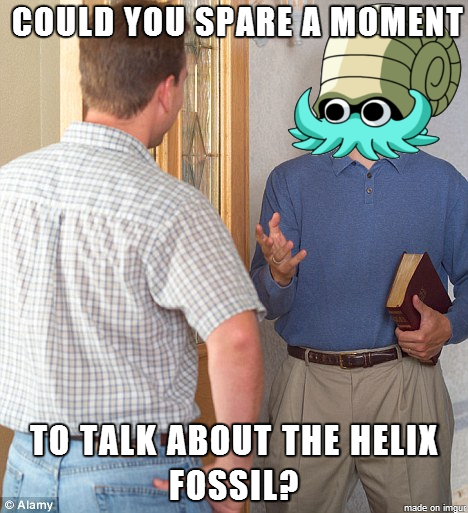 A popular meme depicting the resurrected Helix fossil, resulting in the Pokemon Omanyte. Followers of the Church of the Helix poke fun at the evangelical nature of religion (Image from Imagur). Murray said that when it comes to producing a collaborative story on the Internet, it’s never enough to talk about the medium itself or to poke fun at it. Users need to generate a mythology and with the added decision for the programmer to remain anonymous and turn the control over to the viewers, the audience itself becomes the producers. “Know Your Meme,” a user-created database of memetic materials, or materials which have spread virally to other users, has covered TPP extensively. The ever-growing article not only features the memes that have arisen from the live stream, but it also explains the back stories that helped craft those memes. For example, a subsection on the events of “Blood Sunday” details a moment in which 12 Pokemon were accidentally released into the wild— a moment that many users came to consider equivalent to a mass murder. This in-game event was subsequently covered by the Church of the Helix Choir. “I’ve gotten so many emails from people telling they were absolutely touched by the Church of the Helix Choir songs and that tells me that the songs have transcended short-term fandom or mere hilarity, but have actually become memoirs,” Roebbelen said. “They mean something. I’m still trying to figure out what that means, but I think it’s beautiful. Those viewing TPP analytically have begun to describe it as a “microcosm of the Internet.” The platform reveals facets of Internet fan communities such as media creation, debate and collaboration. Twitch Plays Pokemon has invented mythology, meta-narrative and meaning from blissful randomness. It's a microcosm of the internet. Individuals in these communities are typically labeled as anti-social nerds, but although he himself is guilty of this preconceived judgment at times, Murray said that the expanse of the Internet no longer allows for “nerds” to be the only demographic taking part here. “If that’s who you are, it’s just what you have to do,” Roebbelen said about the community producing original work. TPP finished its second generation with “Twitch Plays Pokemon Crystal,” and Roebbelen wrote pieces to commemorate the ending of both games. Murray said that from an outsiders perspective, TPP may feel like it’s a “microcosm of the Internet,” but to those who play, it has more to say about the nature of human endeavor in general. With a project “designed to fail” such as this, the absurdities of the system make user’s question their reality. Murray said that TPP’s system calls attention to the idea that maybe the absurdity and “existential problem” inherent to life can be conquered when users embrace it. “It might sound depressing, but ‘Twitch Plays Pokemon’ is probably more fun and interesting, community-driven and offering more fulfillment to a lot of people than their daily lives are,” Murray said. The mural was erased within a day, but it had accomplished its goal. Betts wanted to see if he could find a picture of it online without having to post it himself. Satisfied with his work, Betts pulled out his copy of “Pokemon Y,” the latest game in the series, on a gold Nintendo 3DS XL. “I have my DS on me pretty much anytime I think I’ll have a chance to sit down and play it – even if I don’t end up doing so,” Betts said. TPP gave a generation who grew up obsessed with a media franchise a different way to play and think about a beloved game, while also sparking a paradigm shift in Internet cultural discussion. By forcing players to work in a group to try to accomplish something, Geppi found relief in how TPP had created a community of members that could move beyond name-calling and debate. “Regardless of what you think or feel, someone on the Internet is willing to debate you within an inch of your life and make crude comments about your mother while he’s at it,” Geppi said.